Our accomplishments to date in the past year, have placed Mr. Pierce prominently in The New York Times; GlobeSt; Bisnow; National Real Estate Investor Magazine; Student Housing Magazine; Wall Street Journal; Reuters; and many others. Over the past two years BERKMAN has researched the quintessential most influential large Pension, Endowment and Institutional Investment and management specialists and funds where quality investments for their portfolio are made and managed. Once identified BERKMAN developed a high profile Strategic Public Relations outreach plan to position our President and CEO Frederick W. Pierce IV, Pierce Education Properties (PEP) as a premiere thought leader for Student Housing. This was all predicated on establishing a high profile for him and his high quality portfolio to attract the attention of these highly sought after investors as a solid and reoccurring revenue source for PEP capital. We have made significant inroads with high profile journalists and publications who consistently cover this exploding sector of multifamily housing. We created a series of 6 major videos dealing with Student Housing featuring Mr. Pierce. Additionally, we then broke down these 5 minute videos to 45 second teaser videos and launched a PR campaign for each. Our accomplishments to date in the past year, have placed Mr. Pierce prominently in The New York Times; GlobeSt; Bisnow; National Real Estate Investor Magazine; Student Housing Magazine; Wall Street Journal; Reuters; and many others. As a result of our aggressive efforts, we now currently and consistently have print and electronic media searching out Mr. Pierce for his enlightened and high profile commentary on a wide variety of Student Housing and Multifamily oriented topics. His portfolio is very close to 1B in Class A Student Housing assets under ownership and management Nationally. We continue to be aggressive as we are charged with continuing to expand our outreach including his innovation and creativity in providing students with the most thorough array of amenities and personal services available to them anywhere across the Country. We are currently working on a new project for pets whose partnership upside will be seen as a revolutionary accomplishment for Student Housing communities. We will surely use this innovation as a major PR program to communicate World-Wide. Inspired by a real estate industry guru (Sandy Goodkin, founder of The Goodkin Group), during his college internship with Goodkin Fred Pierce set a career ambition of someday owning a major commercial real estate company. At that time, he didn’t have clarity as to whether that would be as a developer, real estate investor, etc., but the tangible nature of commercial real estate combined with the earning potential really motivated him. Fred also had another mentor at Goodkin, Errol Cowan, who instilled in him an entrepreneurial spirt at an early age. Errol told a story how he and his brother each were left $10,000 when their father passed in the late 1960s. Errol’s brother took the money, bought a Harley Davidson and travelled the country until the money was gone. Errol put the money into commercial real estate and 15 years later was a multi-millionaire. That’s the kind of story that can get a young would-be entrepreneur excited. His big break came in 1995 when a former consulting client – San Diego State University Foundation – approached him about a 131-acre, $1+ billion redevelopment project which Fred had conceived for them as a consultant. A couple of California’s largest and most successful developers had been unable to get the project off the ground and had suggested the consultant (Fred) had devised an infeasible development plan. SDSU Foundation wanted to know what Fred had to say about that. He said that he still believed it was very feasible and would show them, if they hired him as their developer. SDSU said, “not so fast”, but did offer to hire Fred, to prepared a business plan for project implementation with the potential, but no promises, that he might get hired to be the developer if they approved the plan. Of course, at that time in Fred’s life, he had only $10,000 in the bank, was in the middle of a divorce and was making payments on literally five properties. So, that sounds like a good time to quit a $180,000 per year job for a $5,000 a month consulting assignment on the hope of a long term project . . . that’s what Fred did. Ninety days later, SDSU Foundation approved the implementation plan and hired him as their master developer. Thus was born Pierce Education Properties (PEP). A little over 10 years later (2006), PEP had established an institutional track record and had a business plan to take the business of student housing and university real estate national. PEP finished its work for SDSU Foundation and entered the next phase of Fred’s professional life. Of course, at that point PEP had no clients, no projects, no income, no investors . . . just Fred’s idea. So he tapped into his savings, borrowed against the house, margined the securities portfolio and convinced three others to come along with him, only one of whom could be paid current. Within 120-days PEP had been awarded two giant development projects with build-out value of $1+ billion and within six months PEP acquired a 3,500-bed student housing portfolio for $130 million. PEP was on the national map. The Great Recession brought some hiccups along the way, be Pierce Education Properties has grown from its initial four employees to a workforce that is 360 people strong. PEP has become a Top 10 national buyer and owner of student apartments in the country, having purchased 20,000 beds for more than $800,000 nationwide since 2007. Today, PEP owns and operates major student apartments at 20 universities across the nation including the likes of University of Florida, Florida State, Georgia, Georgia Tech, South Carolina, West Virginia, Ohio State, Purdue and Iowa State. PEP buys at public universities with 15,000+ students that play Division 1 Football. PEP’s equity capital now largely comes from a large state pension fund and TIAA. Along the way, Fred and PEP have earned a few accolades. In 2012, Fred Pierce received the prestigious Ernst & Young Entrepreneur of the Year (San Diego, Real Estate & Construction Industry), and in 2013 Mr. Pierce was named among 24 national “Student Housing Pioneers” by Real Estate Forum Magazine. Fred has also been awarded SDSU’s highest alumni accolade, The Monty Award as the alumni of the year from the College of Business Administration. 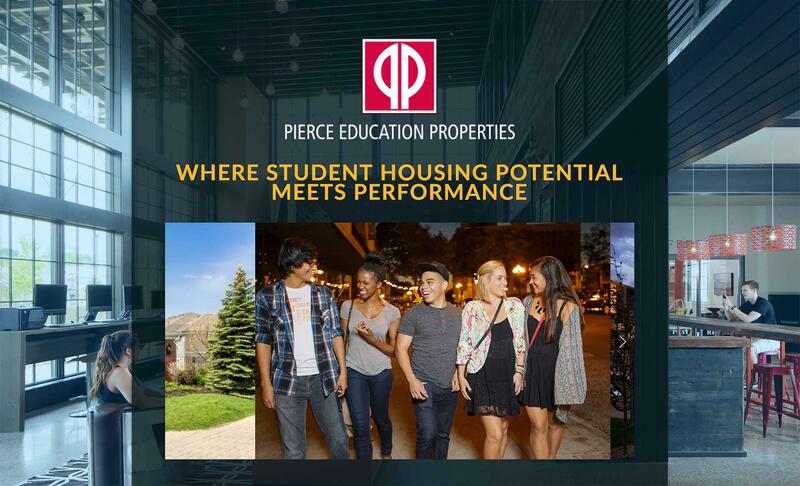 In coming years, Pierce Education Properties expects to reach the ranks of the Top 5 national private student housing operating companies in the U.S. and hold a portfolio in excess of $1 billion of student apartments across the country.